Posted in: 1 Pageant Pages, 2 Shout-out-Looks. Tagged: Miss Universe 2016, Monique Brooks, Steve Harvey. Do you have Soundcloud? Well get one on iTunes or the App Store. 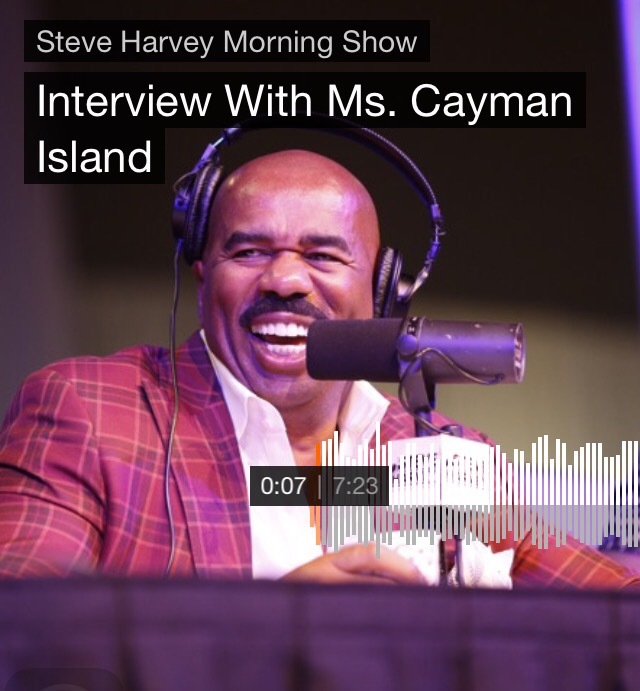 Otherwise, click on this LINK and listen to the audio of the Steve Harvey Morning Show where he has as guest Miss Cayman Island Monique Brooks. What is interesting is the mention of the island of Belize as host of Miss Universe 2016 come December. And mind you, it was mentioned not just once, but twice! Have you listened to it by now, dear readers? Posted in: 1 Pageant Pages, 2 Shout-out-Looks. Tagged: Boyet Loverita, Mario Lopez de Leon Jr, Miss Universe 2016, Paula Shugart, Pia Alonzo Wurtzbach. I really needed to make a post about the visit of Miss Universe 2015 Pia Alonzo Wurtzbach to the Philippine Consulate General in New York City. Aside from the significance of the event to the Fil-Am Press Club, it was also the time to reconnect with the individuals who unconditionally supported and will continue to support during her reign and stay in the Big Apple. Miss Universe Organization (MUO) President Paula Shugart also went with our Queen as she met with Consul General Mario Lopez de Leon, Jr. in the same. A Grand Homecoming to look forward to for Miss Universe 2015 and the entire Philippines! Posted in: 1 Pageant Pages, 2 Shout-out-Looks. Tagged: Miss Universe 2016, Pia Alonzo Wurtzbach. 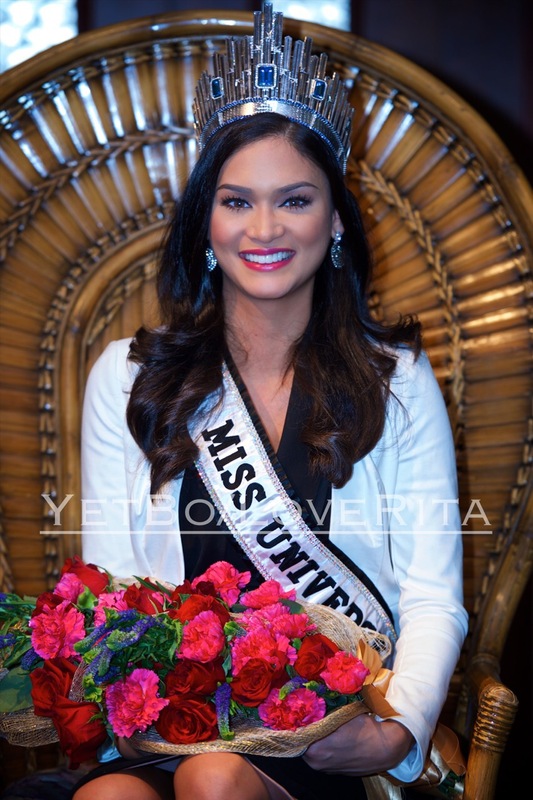 Miss Universe 2015 Pia Alonzo Wurtzbach will have her Grand Homecoming starting on January 23. Two days later, or on the 25th, her Parade will take place around the most important areas in the Metro. On the 28th, she will have her Homecoming Press Conference at the Smart Araneta Center which will be strictly invitational I reckon. In between, she will have endless interviews on TV plus so many appearances that the one-week stay simply won’t be enough to give in to all requests. But that’s life. The Universe now owns our Queen P for her entire reign. And we should be happy that she will be reunited with all of us soon! She will fly back to NYC on the 29th. See you soon, Queen Pia! 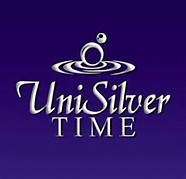 Miss Universe 2016 to be held in Belize? Posted in: 1 Pageant Pages, 2 Shout-out-Looks. Tagged: Belize, Miss Universe 2016, Steve Harvey. 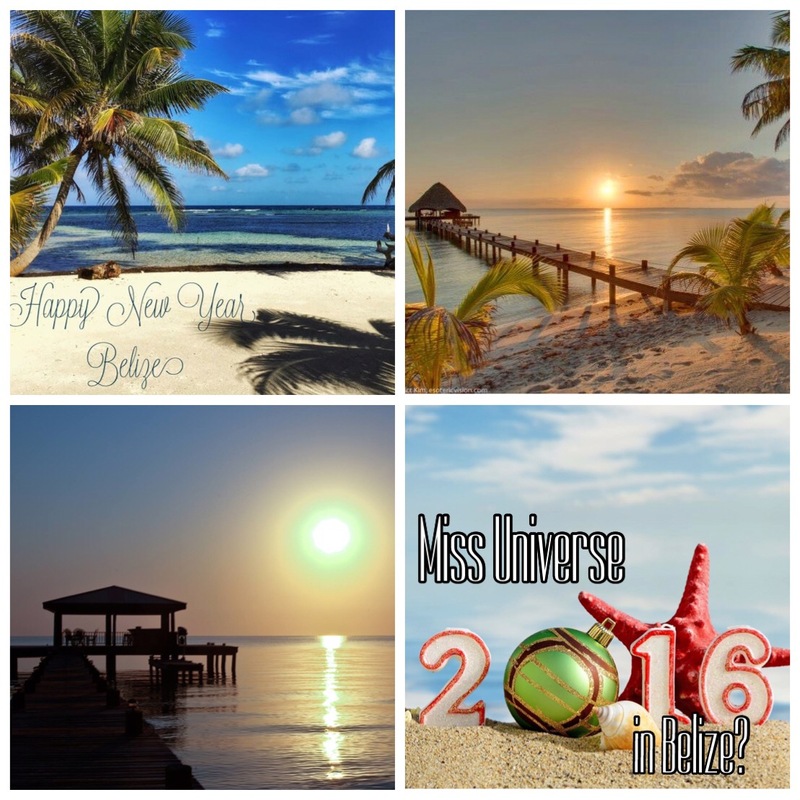 Miss Universe 2016 in Belize? Bring it on! 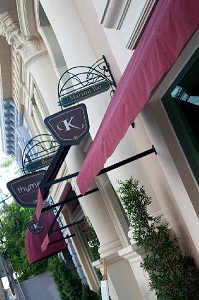 Looks like the new owners of Miss Universe work real fast. 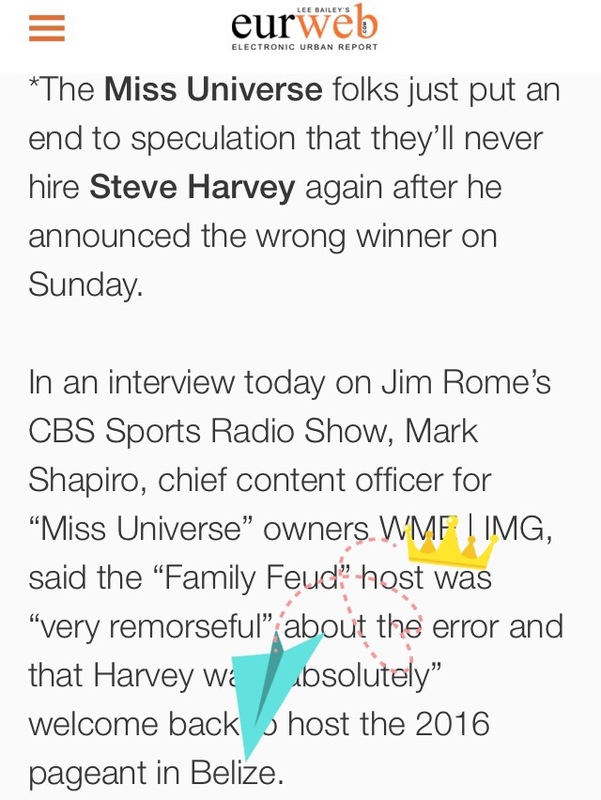 In a recent radio interview with Mark Shapiro (Chief Content Officer of WME/IMG), he welcomed Steve Harvey as return host of the next edition with the mention of Belize as the site of Miss Universe 2016. If confirmed as true in a Press Statement from MUO, then this could be a nice setting, although not as nice if the Philippines will take the job. Belize is a small country that is big on adventures. It has one of the world’s top diving sites in the Great Blue Hole – described by the people at Norfolk as a vertical cave in the middle of Light House Reef Atoll off the coast of Belize, and which offers views of fascinating sea life and geological formations that are unlike anything you’ve ever seen. 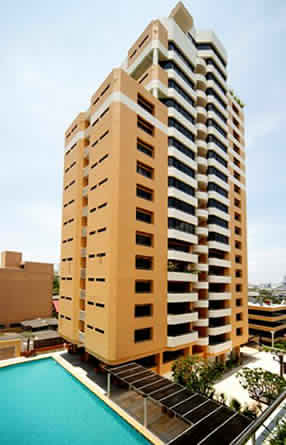 Without a doubt, this is one destination that will be breathtakingly captured in high definition. For sure, there will be lots and lots of swimsuit shots with the candidates frolicking on the beach and enjoying all the water activities of a tropical paradise like Belize. Posted in: 1 Pageant Pages, 2 Shout-out-Looks. 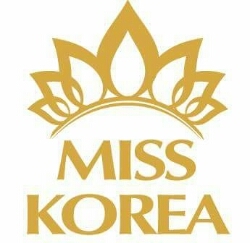 Tagged: Minji Lee, Miss Korea 2015, Miss Universe 2016. 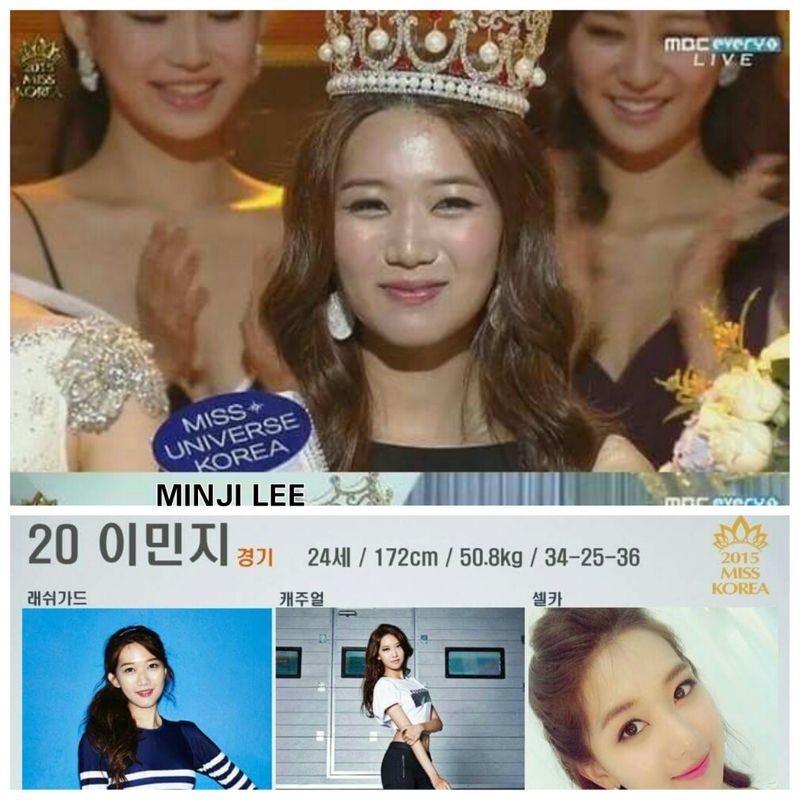 When Minji Lee was crowned Miss Korea 2015 in Seoul last night, one can’t help but wonder why she won over the other more facially attractive candidates in the competition. In fact, her runners-up are relatively more gorgeous. But then again, you look at her all-around assets (photo below) like competitive height, healthy bosoms and nice lean frame. The girl has got the goods to deliver. And with just the right enhancements, she can be more than 100% ready for Miss Universe 2016.